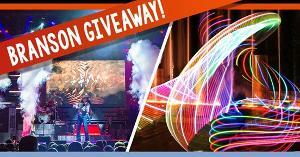 Prize: "4 Days, 3 Nights Lodging at the Branson Hilton for up to 4 people! $100 Dining Certificate to Level2 Steakhouse (Located at the Hilton) $100 Shopping Certificate or 4 Show Tickets! $50 Gas Certificate to fill up your tank and explore all. What you must do to enter: Please fill out all of the information below and click Enter Sweepstakes to be entered into the Sweepstakes.